This week on #CCIspotlight, we meet La’Teef Pyles, co-manager and unofficial community liaison of University Barbershop. La’Teef is a 2016 Westside Innovation Fellow and a current #VoteLocal ambassador with the Center for Civic Innovation. The intimate University Barbershop is more than a place to get a fresh fade from the self-proclaimed (though not disputed) Fade Doktor. It is a community hub, a training center, and a study hall. It is a place for concerned residents, young scholars, and new parents to come together and learn from each other so as to make their community stronger. Tell us a little about yourself. What are you doing, how did you get here, and what are the sources of inspiration that got you started? I moved here from Chicago in 1998 to go to school in Atlanta. I decided that staying here was the best decision. It was a fork in the road and I chose the right path obviously. I've been working in the downtown area since roughly 2000. I opened my own barbershop in the Vine City area in 2006. Shortly after, a tornado came by and knocked the roof off my shop, and through that experience I met my business partner Terrance, who I run University Barbershop with. When I needed a place to work I chose University Barbershop. We’ve been here since December 2010. I think my favorite part is really learning what the people in the community need, what they're looking for, and being able to speak to them clearly in a manner that we can get some understanding from each other. I'll never say I'm teaching anybody...I'm really having these discussions so we can learn from each other. That's the best part about it, really, seeing and learning from all the people in the neighborhoods and what they know and don't know. The sharing experience is pretty awesome. Tell us about the venture you’re working on. What does the University Barbershop do? Before going through the Westside Innovation Fellowship, we were doing some mentoring through the barbershop. We had a group of kids coming through here that I was directly responsible for. We offered a fatherhood class, which is basically a conversation with new dads - we shared different tips with one another that about raising kids from zero to five. Since I finished the Westside Innovation Fellowship, we’ve been offerring programming at a local middle school, away from the barbershop. From HIV awareness to a reading program, we've been doing so many different things in the community that connecting with CCI seemed like a way to get the story of the work we’re doing out to the public. Now I’ve become involved in the #VoteLocal campaign, which is what I'm really interested in. I figure the candidates and the people that are running for office should probably come through the barbershop and talk to the people that are going to vote. We’ve had several candidates come through the barbershop. I would love to now use this platform to let people know more about the local elections. This is really important, especially when you look at the voting rates in Atlanta and the voting rates around here. What impact do you think you've had so far? I am the Vice Chair of my Neighborhood Planning Unit, and I've been the Youth Committee Chair. I’ve been involved with Vine City Civic Association. For anything that's going on with West Side Future Fund -I'm hanging out with those guys - anything that deals with 30314 or Vine City community, English Avenue community... I am at the table. If the YMCA is coming over to talk to us, I'm going to be at the table listening to them. I am the Nosy Neighbor. That's what I do...but I don't know what kind of impact it’s making. As far as my involvement in my community… I want to know about it. I don't know it all but I like to keep up with what's happening. The biggest challenge, from what I see riding around, is that we have all of this economic growth without giving people a livable wage. So I'm trying to figure out how we’re building all of these things but this is the worst place in the country to rent. So, that's the biggest challenge I see for the city. The city is building all of this stuff but we don't have the wages to maintain it, and to live in it. Why did you decide to be a fellow at CCI? How has CCI supported you in your work? 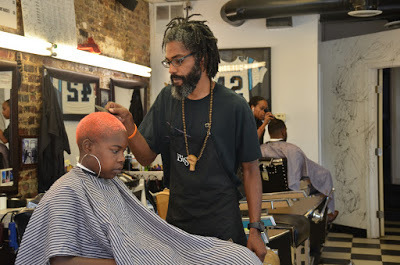 Since I moved to Vine City in 2006, I have recognized the importance of the barbershop connecting to the community. We did a couple things from my former shop that we carried over to the new shop. I saw the opportunity that CCI offered through the fellowship - teaching social entrepreneurs. When I find out about that I said “Okay, let me learn as much is I can.” It's been a great experience so far. CCI has lent credibility to what we've got going on. The information that they shared with us about marketing your business to a social platform - that was pretty cool. I haven't gotten a handle on it yet because all the college kids want to get paid to do that. And I'm like "man I can't pay you to take pictures, man.” But yeah, outside of that, working with CCI has really opened up avenues to different resources. Being able to go down there and talk to the mayoral candidates- that's also pretty cool. What advice do you have for any other entrepreneurs in Atlanta? I'm not an advice giving person but I would tell them about my experience of being new here with the service or product that I have. I would say to just be passionate 100 percent about what you do and your skills, and whatever your services are. 100 percent. Don't be saying things like "I've got to do this part time." I moved here from Chicago and didn't know anybody. I let people know what I do. I was passionate about what I do - I don’t have a part time job. I'm here all day. Eventually (a couple of years later) I'm able to take care of me and my family with my work. Don’t give up on what you do. Is there anything you want to say to everyone reading the CCI blog? The barbershop and the barbershop industry, and this barbershop in particular, is a great place too if you have a targeted message for demographics, this is a great place to get that message out. 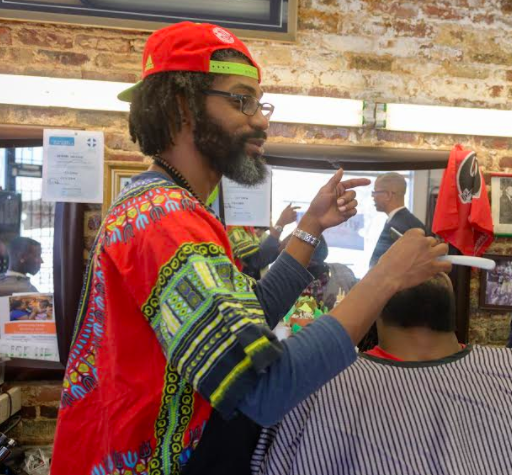 So if there's a targeted message you want to share with black men, or college students, or fathers, men with prostate cancer, this (the barbershop) is a prime location to do it. Our demographic spans from kids all the way to seniors. So, if there's a message you need to get us, this is the place to do it. La’Teef wanted us to remind everyone to check out voteATL.org, the new platform launched by CCI late last month. Check out when your closest Civics 101 event is! We would like to send many thanks to La’Teef for discussing his experiences and motivations with us at University Barbershop. Get a haircut from the best barbers around (only $10 on Mondays and Wednesdays), on the corner of MLK and Brawley! The Center for Civic Innovation aims to be a place that supports and showcases these community leaders to the world. This blog series will highlight one entrepreneur or organization from Atlanta every week from now until the end of the year. We hope their stories will inform and inspire.